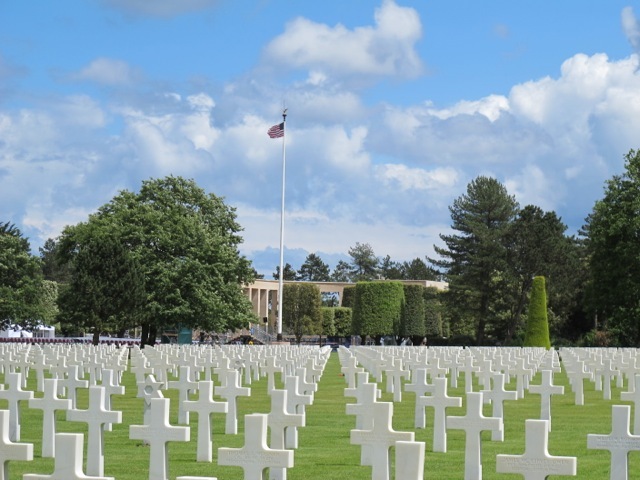 Meredith and I made two visits to the American Cemetery at Omaha Beach before Friday’s D-Day commemoration. 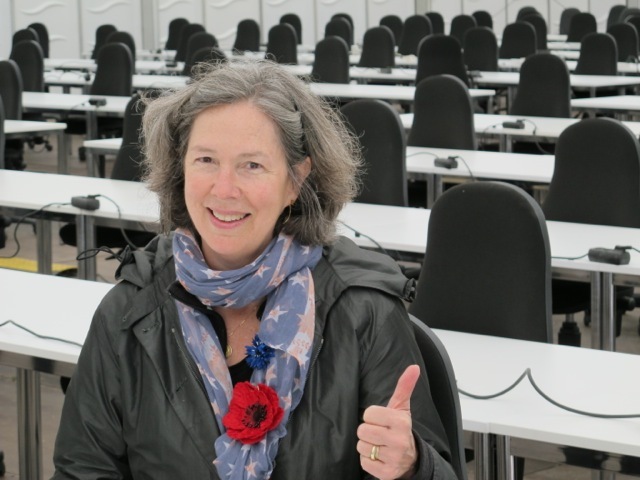 On Wednesday 4th she had arranged to meet an old high school classmate who was in charge of NBC TV’s coverage of the D-Day Ceremony. 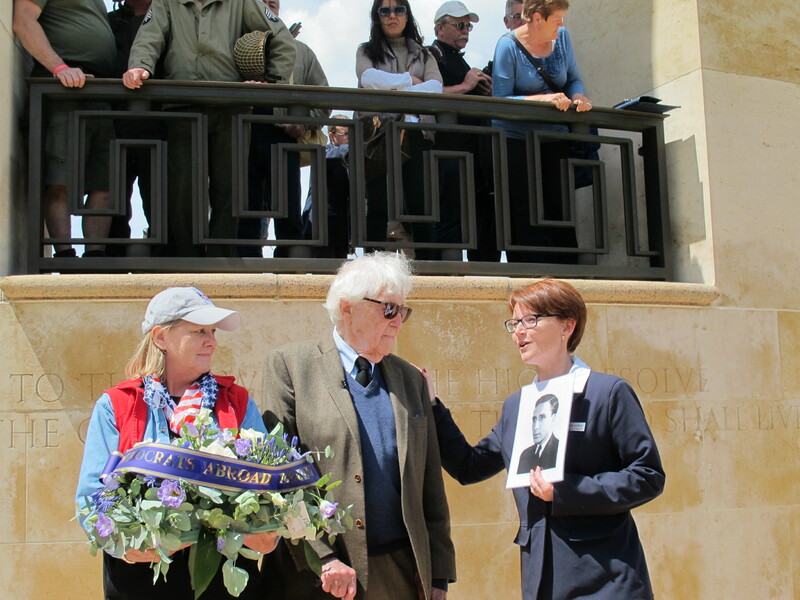 The following day we returned to hear John Morris, a founding member of Magnum photo agency, deliver a short speech at the Memorial to honor of a friend who had been killed soon after the landings. He laid a wreath. 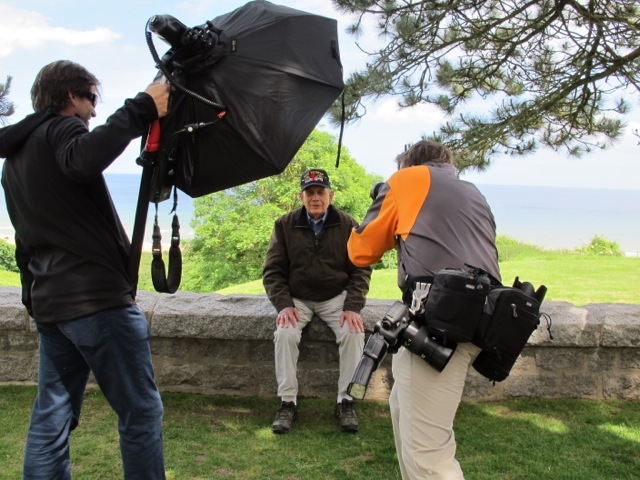 John, who is 97 and first voted in a presidential election in 1935, also had a D-Day story to tell, which NBC’s Andrea Mitchell reported. 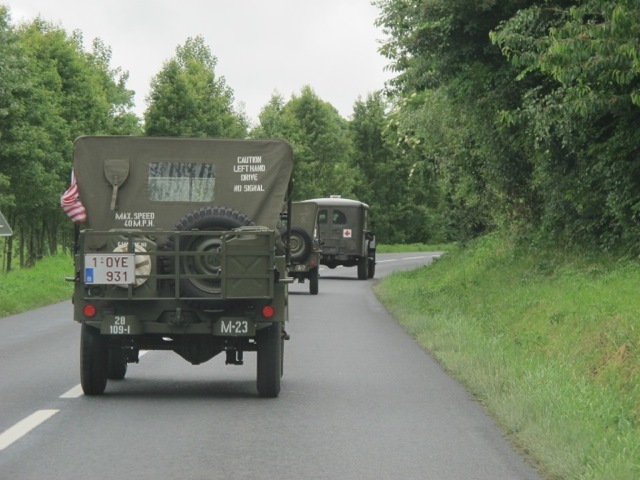 The narrow lanes in Normandy link small villages where the damage has been repaired and only gratitude remains. 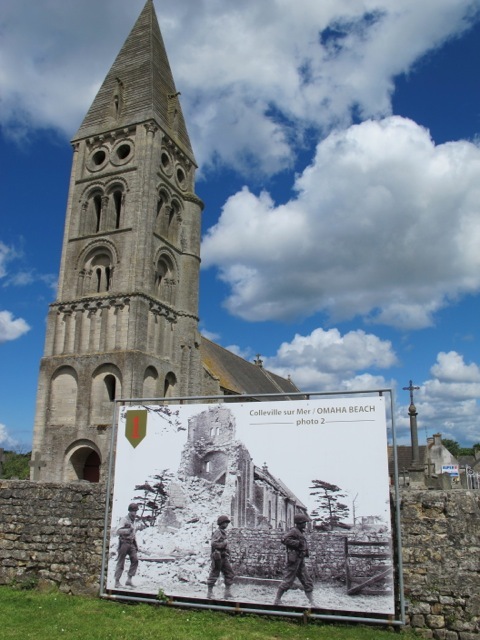 Buildings are restored to former beauty–though the photographs from 70 years ago strategically placed (badges of honor almost) give a “Before and After” idea of the devastation wrought by allied bombing seventy years ago. 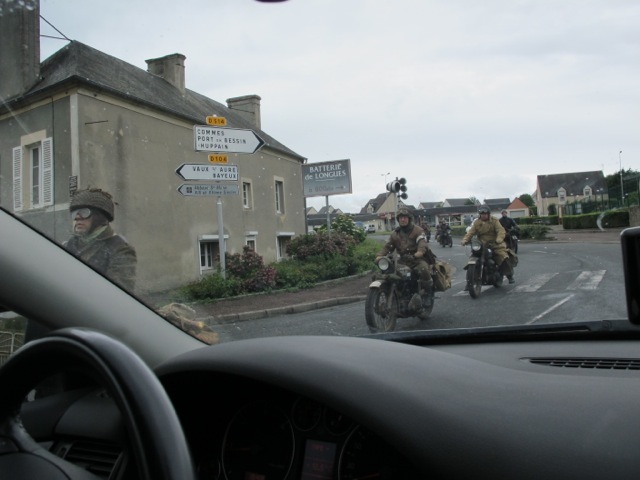 Our journeys through the Normandy countryside are full of surprises. 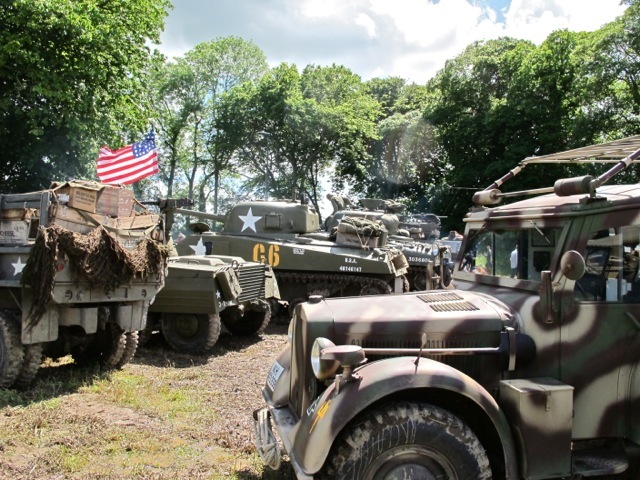 No fighting troops but troops there are a-plenty–fully kitted out. 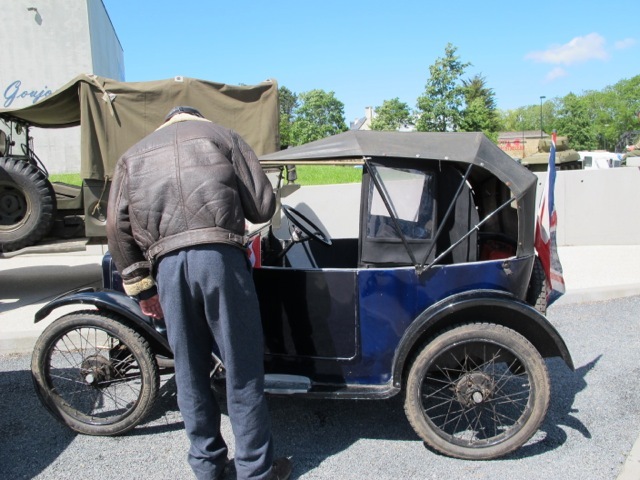 …and driving every conceivable type of vehicle of the era. 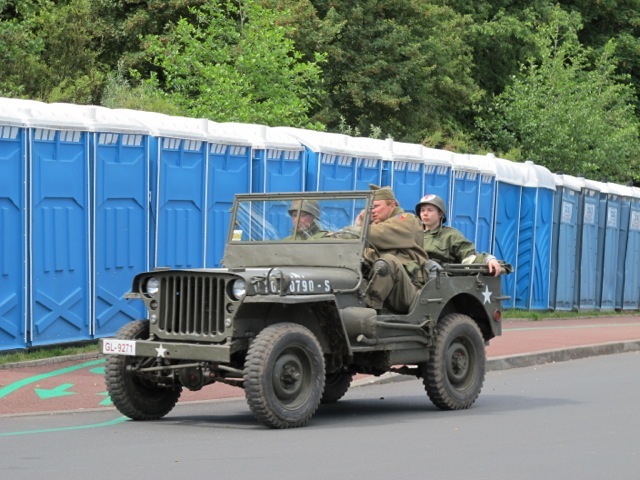 Willys jeeps predominate–the ones we grew familiar with in post war films, usually transporting a cigar-smoking John Wayne or Robert Mitchum at speed. Answering a call of nature!? I had a schoolboy crush on the Willys jeep, seeing myself in the Mitchum role long before I ever imagined I’d be an actor. 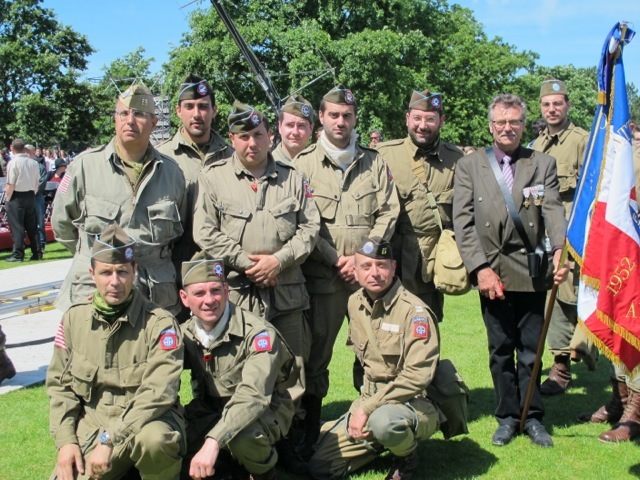 These “troops” processing at a more leisurely pace through the tranquil countryside are “re-enactors”, come to Normandy to do just that, re-enact incidents from the past and lend a non-violent “dressing” to the scene. 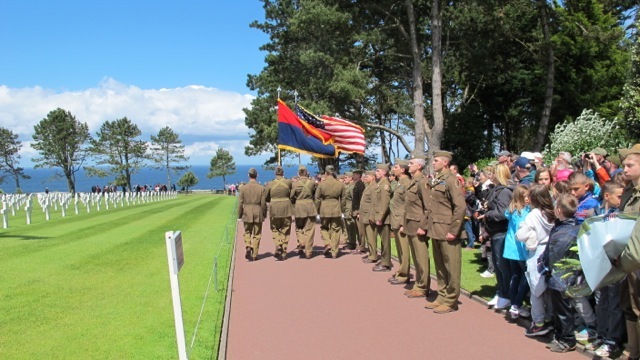 After lunch with Bob “backstage” at the American cemetery on Wednesday, we watch a Belgian company of re-enactors paying tribute to the fallen with a full ceremony–including Taps (the Last Post) in front of the American flag. They attract a crowd, perhaps providing a focus for people visiting this overwhelmingly emotional place. “Backstage” is the area where all the TV companies prepare the technical paraphernalia for the big day. Meredith feels a touch of déjà-vu…. Transported momentarily back into a previous life as a TV producer and writer with ABC News in New York. 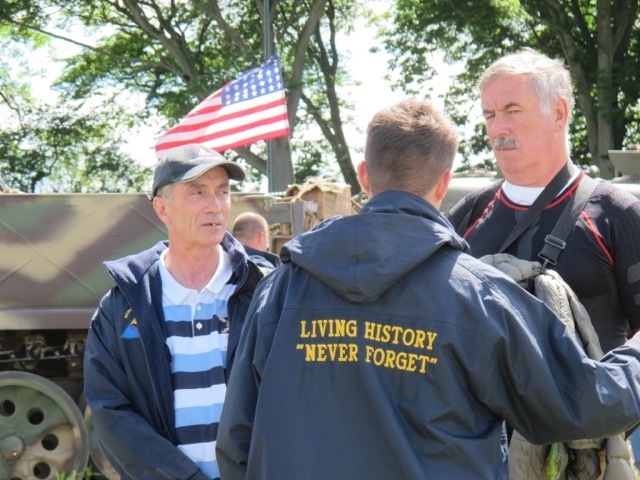 John Morris is telling the story he has told a thousand times since 7th June 1944. 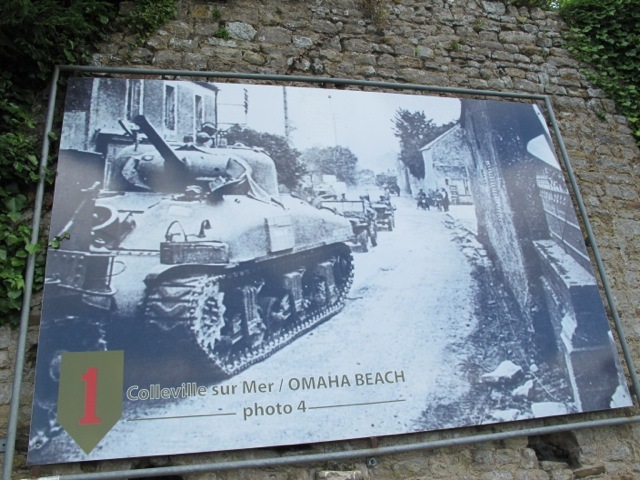 He was based in London–Photo Editor of LIFE magazine–waiting anxiously for the first images of the invasion to arrive from the legendary photographer, Robert Capa–who was with the initial wave of American soldiers on Omaha Beach. 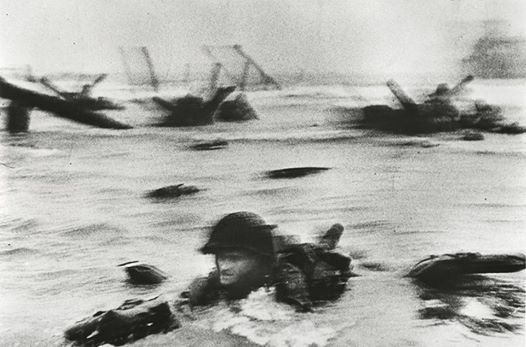 The first three rolls of film were ruined when a darkroom technician tried to speed up the development process–but John managed to find a few frames which remain the defining photos of the American D-day landing. 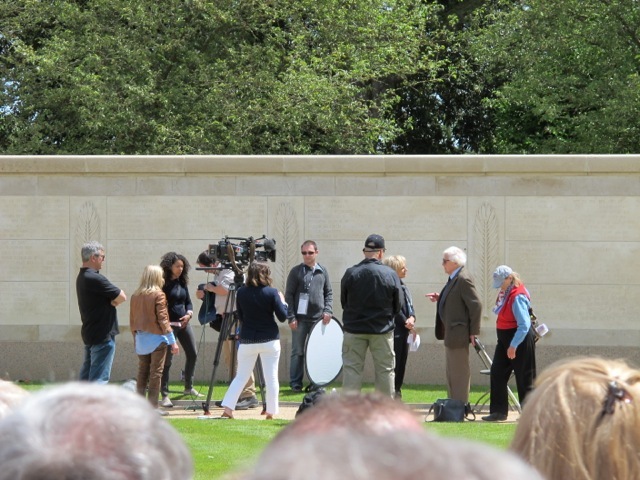 The backdrop to the interview is the Wall of Remembrance–dedicated to those Missing in Action. This is one of the eleven surviving images. John Morris points out in another interview that to take the photo, Robert Capa would have to have been on the beachside of the swimmer with his back to the German guns. in awe at the bravery of those men wading ashore. It is good that we remember them – and it’s a wordlwide thing, Robin. 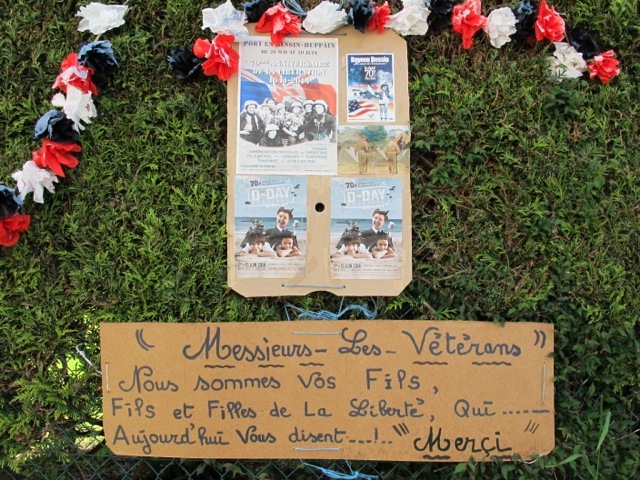 In my case I have 3 great Australian uncles buried in France from WWI. One day I hope to see their graves. Lest We Forget. Wonderfully moving and how our lives are entwined with those brave men. 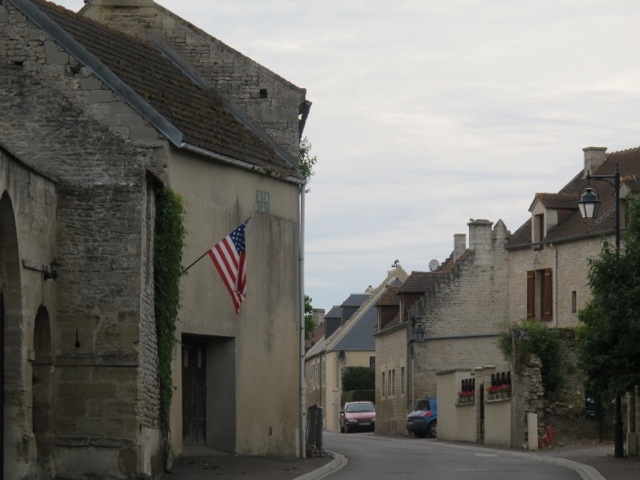 We’ve just returned from Normandy sticks, having little gite there and see so much to remind us of what went before, each trip. Love the emails. Thank you Robin and Meredith. We must never forget what was done that day. I hope one day to visit there. My father was in Patton’s division. They were all so young and determined. Great photos and so appreciative of your sharing your days there. A touching and eloquent tribute, Robin. Thank you. Great post, Robin. I love reading all your blogs. Thank you for covering the events so thoroughly, this post and your previous on the subject. I learned a lot I didn’t know. Your coverage made me feel like I was there. Thank you so much Robin for such a wonderful glimpse into an auspicious occasion. 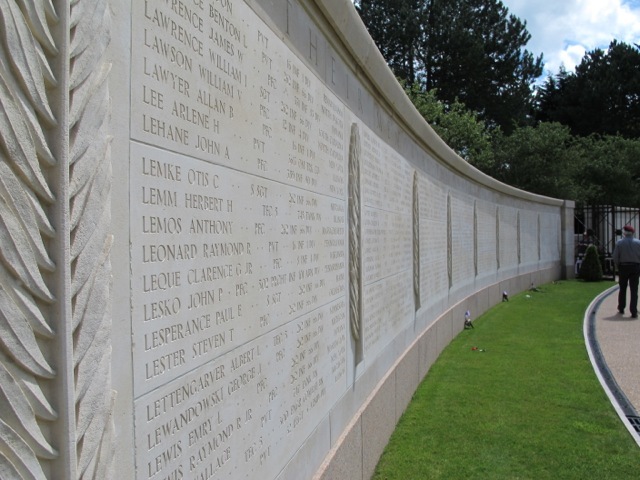 Your other correspondents are right: we must never forget the sacrifices those wonderful men and women made for us. Wonderful to see your post. Watched the bbc coverage with pride and sadness. My father was in 6commando landing on Sword beach that morning, though badly injured he survived. Sadly he died in 72 aged 54′ I was 14. I’m so proud of him and will never forget those wonderful young men. 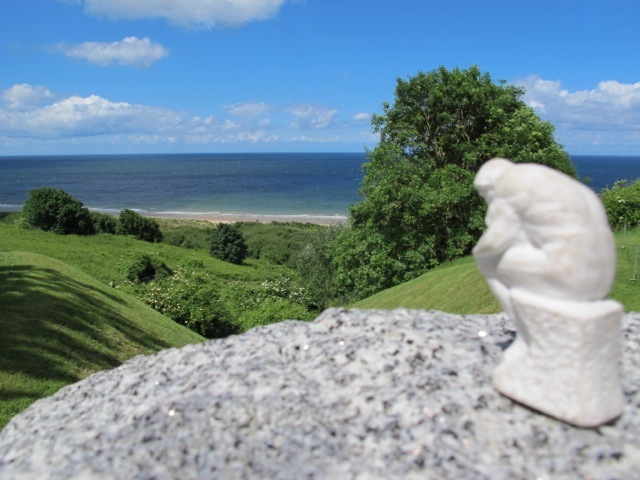 Thanks Juliette–visiting there is a humbling experience. always in awe of those brave men. Nice post. 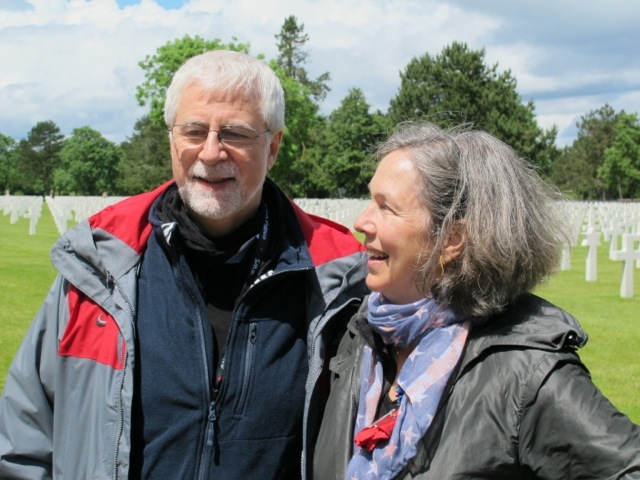 Thoughtful tribute, write-up and lovely photos. Thank you Robin and Meredith for sharing this! Yes indeed. Thank you for both posts.